I love looking at old homes. One of my favorite pastimes is walking through the older parts of town and admiring the homes and their varying styles and what people have done to add their own character to them. There are certain homes I spot and immediately deem “Christmas Homes.” Those are the houses that look cozy and warm, like the front yard should be blanketed with white snow and bright string lights daintily hung across the front door as a beacon for family to enter and get cozy. I picture smoke billowing out of the chimney and a festive tree in the front window. As I pass, I picture people in flannel pajamas running downstairs on Christmas morning, sipping hot coffee and sharing breakfast while opening gifts and enjoying time together. It’s basically the scene of any good Christmas movie. All of this on a July day in Louisiana while I sweat it out outside. It is just one of my things. This recipe is basically that picture in food form—a “Christmas Morning Recipe.” It is the kind of recipe meant to be enjoyed with people and hot coffee. It is warm, comforting, sticky and the kind of indulgent that feels right for Christmas Day. It creates space for family since you can prep on Christmas Eve and bake right when you wake up on Christmas morning. I am all for homemade goodness and less time in the kitchen and more time with people. Best of both worlds. This recipe makes homemade cinnamon rolls a little less intimidating by using a basic biscuit dough recipe. I know sometimes baking with yeast can make people too nervous to even try, so this is a much simpler version. Let’s be honest—navigating the holidays, wrapping the presents and decking the halls is plenty of work on its own. 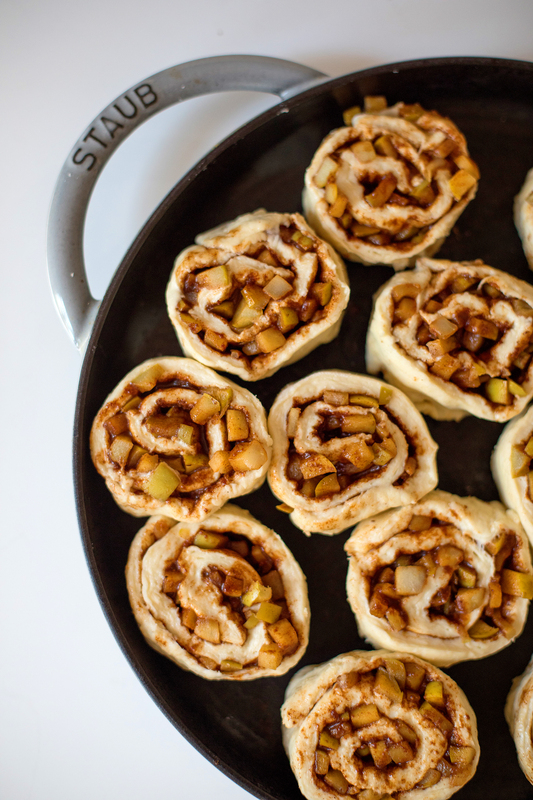 Plus, we make them even more festive by stuffing them with a delicious spiced apple mixture that makes these rolls festive and special. Note: Best enjoyed with cozy slippers, Aaron Neville Christmas music humming in the background, and a fire roaring in a fireplace. Can alternatively watch video of a fireplace on a hot Louisiana Christmas, which happens. 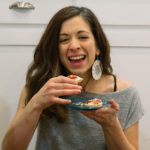 Leah Conti is the writer and kitchen adventurer behind thejuniperkitchen.com, as well as an avid food lover, nonprofit co-creator (junipertable.org), part-time photographer and mom. Check out another party-perfect holiday recipe from Leah in this story from inRegister’s November 2018 issue. For Apple Mix, dice apples into VERY small pieces. I leave the skin on my apples, but feel free to peel them. Warm a skillet over medium-high heat and add butter until it melts. Toss in apple. Add lemon juice and remaining ingredients to pan, and mix until incorporated. Turn down heat to low and cover with a lid. Allow to cook for about 10 minutes or until softened. Turn off heat and allow to cool while making cinnamon rolls. For Cinnamon Filling, mix cinnamon and sugar in a small bowl and set aside. Have butter ready and softened for after dough is rolled out. For Dough, mix together dry ingredients in a large bowl. Cut in cold butter, and mix until a crumbly texture appears. Alternatively, this is how I cut in my butter in a more rustic way: Take stick of cold butter and dice into small squares. With clean hands, toss butter into flour mixture and, using your fingers, break butter up and mix it into flour until small crumbles form. Once butter is mixed in, pour in milk and mix to combine. Knead dough for 2 to 3 minutes or until smooth and well mixed. Place on a floured surface and roll out into a rectangle that is about 17 x 15 inches. Using a butter knife, gently spread the 1 to 2 tablespoons of softened butter (from Cinnamon Filling ingredients list) over surface of dough. Then generously sprinkle surface of dough with Cinnamon Filling. Add cooled Apple Mix, sprinkling it to cover surface of rolls. Now we are ready to roll. 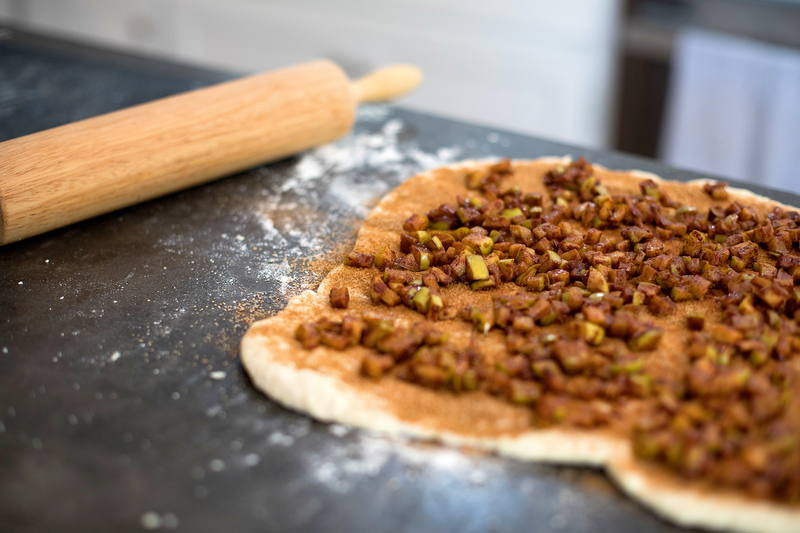 Gently lift edges of dough and begin to roll tightly into a 17-inch log. Once rolled, cut into individual rolls. I eyeball this, but if you are precise you can measure into 1-inch sections. Using a buttered 9 x 13-inch baking dish or a 12-inch cast iron skillet, place rolls closely snuggled in pan. Reshape as needed, as they can shift while cutting. (Since these don’t have yeast, they won’t rise, so the shape you leave them in is how they are going to bake.) Pop into oven for 25 to 30 minutes or until top is very lightly golden. While they bake, make Glaze by stirring confectioners’ sugar, milk and vanilla together in a bowl until it reaches proper consistency. Drizzle warm rolls with Glaze and dig in! These are best served hot and fresh out of the oven alongside a piping hot cup of coffee with people you love. Enjoy the sticky fingers and Christmas chaos. Note: To prep before, do everything but bake and glaze rolls the night before. Cover rolls, place in fridge, and simply pop them into the oven on Christmas morning!